People make poor economic choices. They don’t save enough for retirement. They refuse to cut their losses on plummeting investments because they won’t own up to mistakes. They buy houses and stocks when prices are high, thinking that what’s going up today will keep going up tomorrow. 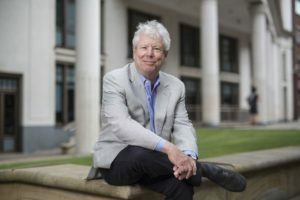 Richard Thaler of the University of Chicago Booth School of Business on Monday won the Nobel economics prize for documenting the way people’s behaviour doesn’t conform to economic models that portray them as perfectly rational. As one of the founders of behavioural economics, he has helped change the way economists look at the world. Far from being the rational decision-makers described in economic theory, Thaler found, people often make decisions that don’t serve their best interests. Illogical human behaviour has economic consequences: Baby Boomers haven’t saved enough for old age. Americans kept buying houses even as prices soared in the mid-2000s, creating a bubble that burst and triggered the biggest economic downturn since the 1930s. To limit the damage, behavioural economists say, economic policy needs to take human foibles into account. Thaler’s work is grounded in day-to-day reality and connected to popular culture in a way that isn’t always true of Nobel-winning economists. “He’s made economics more human,” said Peter Gardenfors, a member of the prize committee. Thaler had a cameo alongside pop star Selena Gomez in the film “The Big Short” and once analyzed the flawed strategies of participants in the game show “Deal or No Deal.” He’s looked into how taxi drivers decide to spend their days and how school cafeterias should display their food. Thaler won the 9-million-kronor (US$1.1-million) prize for “understanding the psychology of economics,” Swedish Academy of Sciences secretary Goran Hansson said Monday. He is the 13th Nobel-winning economist from the University of Chicago. Oddly, the University of Chicago is closely associated with the classical economic views that Thaler has challenged. “There’s nothing people like better at the University of Chicago than a good argument,” Thaler says. In fact, Thaler is golfing buddies with an intellectual rival, Eugene Fama, the classical Chicago economist who won the Nobel in 2013 for arguing that financial markets are rational. The irrational labeling of money is, in fact, part of Thaler’s work. He’s found that people’s tendency to assign money to certain categories can lead to financial mistakes. For example, consumers might spend more they need to when they put, say, a new washing machine on a high-cost credit card because they don’t want to tap money they’ve labeled as savings. In one study, Thaler and his colleagues looked at how taxi drivers try to balance making money versus enjoying their leisure time. The driver might respond by setting a goal: Once his take from fares reaches a certain amount, he calls it a day. But that would mean that he works shorter hours when demand for taxis is high and longer ones when business is slow. If he took another approach, he could make more money working fewer hours — and there would be more cabs in the street when customers need them. Thaler and other behavioural economists also found that people hold notions of fairness that confound classical economic expectations. They resent, for example, an umbrella peddler who raises prices in the midst of a downpour; traditional economists would say the peddler is just responding to increased demand. Thaler’s research has implications for economic policy. In their 2008 “Nudge” book, Thaler and Sunstein suggested that policymakers find ways to coax, rather than coerce, people into making the right decisions. They look at a school cafeteria. Suppose the cafeteria staff realized that students choose food based on the order in which it is presented. It would make sense, Thaler argues, for the school to put the healthiest food where kids would be most likely to grab it. Some critics call such policies manipulative. But returning to the cafeteria example, Thaler argues that the food has to be displayed somehow; so why not choose the one that promotes good health? Thaler says behavioural economics is nothing new. Adam Smith, author of the 1776 classic “The Wealth of Nations,” dealt with behavioural issues back in the 18th century, including the need to control impulses and avoid overconfidence. A series of financial crises, including the dotcom crash of 2000-2001 and the collapse of the American housing market in the mid-2000s, have put a dent in the view that people and markets are rational.